Of the "First Five Hundred". Enlisted, Sept. 8. 1914; British Mediterranean Expeditionary Force, Aug. 20, 1915; Evacuated Suvla sick, Dec. 5, 1915; Invalided to England, Dec. 26, 1915; Attached to Depot, Ayr, March 3, 1916; British Expeditionary Force, March 28, 1916; Joined Battalion, April 15, 1916; Killed in action, Beaumont Hamel, July 1, 1916. Enlisted, Sept. 2, 1914; Sergeant, Sept. 21, 1914; Acting Company Sergeant Major, Dec. 11, 1915; Acting Staff Sergeant, April 5, 1916; Demobilized, U. K., March 5, 1919; Awarded Meritorious Service Medal, June 3, 1919. 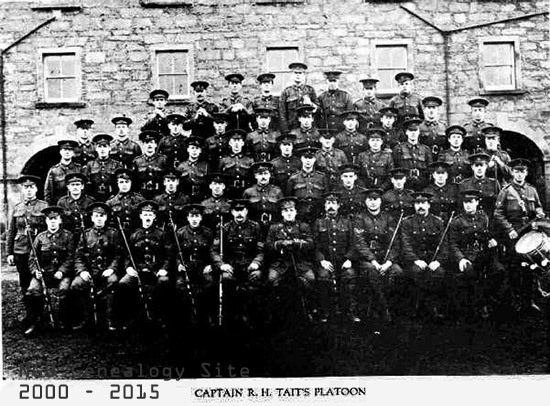 Enlisted, Sept. 5, 1914; British Mediterranean Expeditionary Force, Aug. 20, 1915; Evacuated Suvla, sick, Dec. 3, 1915; Invalided to England, Dec. 25, 1915; Attached to Depot, Ayr. Feb. 24, 1916; Embarked for Newfoundland on furlough July 21, 1918: Demobilized, St. John's, Feb. 15, 1919. Enlisted, Sept. 16, 1914; British Mediterranean Expeditionary Force, Aug. 20, 1915; Lance Corporal, Feb. 27, 1916; British Expeditionary Force, March 14, 1916; Wounded, Somme raid, June 28, 1916; Rejoined Battalion, July 21, 1916; Sergeant. Sept. 28, l916; Wounded, Gueudecourt, Oct. 12, 1916; Invalided to England, Oct. 16, 1916; Attached to Depot, Ayr, Dec. 4, 1916; Returned to B. E. F., Sept. 7, 1917; Wounded, Broembeek, Oct. 9, 1917; Rejoined Battalion, Oct. 25, 1917; Evacuated to Hospital, Jan. 21, 1918; Rejoined Battalion, March 18, 1918; Wounded, Passchendaele, April 12, 1918; Invalided to England, April 16, 1918; Attached to Depot, Winchester, June 24, 1918; Embarked for Newfoundland on furlough, July 21, 1918; Demobilized, St. John's Feb. 15, 1919. Enlisted, Sept. 2, 1914; British Mediterranean Expeditionary Force Aug. 20, 1915; Evacuated to England, sick, Dec. 5, 1915; British Expeditionary Force, March 28, 1916; Lance Corporal, Aug. 8, 1916; Corporal, Sept. 14, 1916; Sergeant, April 18, 1917; Company Quartermaster, Sergeant Dec. 26, 1917; Company Sergeant Major; April 25, 1918; Returned to Newfoundland on furlough, July 27 1918; Attached for duty to Depot, St. John's, Nov. 28, 1918; Demobilized, St. John s Aug. 25, 1919. Enlisted, Sept. 2, 1914; British Mediterranean Expeditionary Force, Aug. 20, 1915; Corporal, Feb. 27, 1916; British Expeditionary Force, March 14, 1916; Sergeant, June 11, 1916; Killed in action, Beaumont Hamel, July 1, 1916. Enlisted, Sept. 2, 1914; British Mediterranean Expeditionary Force Aug. 20, 1915; Evacuated Suvla, sick, Nov. 16, 1915; Joined Battalion Suez, Jan. 31, 1916; British Expeditionary Force, March 14, 1916; Wounded, Beaumont Hamel, July 1, 1916; Invalided to England, July 3, 1916; Repatriated to Newfoundland, March 9, 1917; Discharged, St. John's, medically unfit, April 11, 1917. Enlisted, Sept. 2, 1914; British Mediterranean Expeditionary Force Aug. 20, 1915; Lance Corporal, Nov. 14, 1915; Served with 1st Composite Battalion, Western Egyptian Frontier, Dec. 1915 to Feb. 1916; British Expeditionary Force, March 2, 1916; Evacuated to Hospital, April 12, 1916; Invalided to England, April 23, 1916; Attached to 2nd Battalion, Aug. 1, 1916; Returned to B. E. F., Sept. 7, 1917; Killed in action, Marcoing, Nov. 20, 1917. Enlisted, Sept. 14, 1914; British Mediterranean Expeditionary Force, Aug. 20, 1915; Evacuated Suvla, sick, Nov. 26, 1915; Invalided to England, Jan. 2, 1916; British Expeditionary Force, March 28, 1916; Wounded, Beaumont Hamel, July 1, 1916; Died of wounds, July 2, 1916. Enlisted, Sept. 2, 1914; Returned to Newfoundland, May 18, 1915; Discharged, St. John's, medically unfit, May 26, 1915. Enlisted, Sept. 7, 1914; British Mediterranean Expeditionary Force, Aug. 20, 1915; British Expeditionary Force, March 14, 1916; Wounded, Beaumont Hamel, July 1, 1916; Invalided to England, July 6, 1916; Attached to Depot, Ayr, Nov. 15, 1916; Returned to B. E. F., March 25, 1917; Lance Corporal, May 17, 1917; Acting Corporal, Dec. 26, 1917; Admitted to Hospital, April 25, 1918; Invalided to England, May 25, 1918; Acting Sergeant Aug. 6, 1918; Embarked for Newfoundland, Aug. 7, 1918; Discharged, St. John's, medically unfit, Sept. 30, 1918. 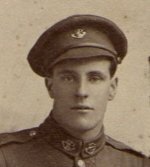 Enlisted, Sept. 2, 1914; British Mediterranean Expeditionary Force, Aug. 20, 1915; Evacuated Suvla, sick, Dec. 2, 1915; Invalided to England, Dec. 23, 1915; Lance Corporal, April 15, 1916; Attached Depot, Ayr, April 17, 1916; Corporal, Aug. 11, 1916; Sergeant , Oct. 27, 1916; 2nd Lieutenant, Nov. 15, 1916; Returned to B. E. F., May 5, 1917; Awarded Military Cross, Oct. 9, 1917; Lieutenant, March 18, 1918; Embarked for Newfoundland on furlough, July 21, 1918; Returned to U. K., Oct. 19, 1918; Returned to B. E. F., Nov. 4, 1918; Embarked for Newfoundland, May 22, 1919; Retired, St. John's, June 21, 1919. Enlisted, Sept. 5, 1914; Corporal, Sept. 21, 1914; Sergeant, Oct. 3, 1914; British Mediterranean Expeditionary Force, Aug. 20, 1915; British Expeditionary Force, March 14, 1916; Wounded, Sailly-Saillisel, March 3, 1917; Company Quartermaster Sergeant, May 20, 1917; Invalided to England; Returned to B. E. F., May 10, 1918; Returned to Newfoundland on duty, July 18, 1918; Demobilized, St. John's, Nov. 3, 1919. Enlisted, Sept. 7, 1914; Repatriated to Newfoundland, Dec. 14, 1914; Discharged, St. John's, medically unfit, Jan. 7, 1915. Enlisted, Sept. 22, 1914; Died at Fort George, Jan. 1, 1915. Enlisted, Sept. 4, 1914; Lance Corporal, July 28, 1915; British Mediterranean Expeditionary Force, Aug. 20, 1915; Evacuated to England, March 26, 1916; Returned to Newfoundland on furlough, Aug. 3, 1916; Corporal, April 24, 1917; Embarked for U. K., Dec. 31, 1917; Sergeant, Jan. 2, 1918; Attached for duty to Pay and Record Office, London, May 29, 1918; Repatriated to Newfoundland on compassionate grounds, Nov. 20, 1918: Demobilized, St. John's, Oct. 18. 1919. Enlisted, Sept. 8, 1914; Lance Corporal, Sept. 21, 1914; Corporal, Oct. 3, 1914; Sergeant, April 21, 1915; 2nd Lieutenant, Aug. 16, 1915; British Mediterranean Expeditionary Force, Aug. 20, 1915; Evacuated Suvla, sick, Nov. 6, 1915; Invalided to England, April 4, 1916; Attached to Depot, Ayr, July 4, 1916; Returned to Newfoundland, Aug. 23, 1916; Arrived U. K., April 30, 1917; British Expeditionary Force, May 4 1917; Evacuated to Hospital, June 21, 1917; Invalided to England July 8, 1917; Attached to Depot, Ayr, Nov. 29,1917; Returned to B. E. F., Jan 5, 1918; Wounded, Belgium, March 28, 1918; Invalided to England, March 31, 1918; Returned to Newfoundland, May 22, 1919; Retired, July 5, 1919. Enlisted, Sept. 2, 1914; Lance Corporal, April 21, 1915; Corporal, July 27, 1915; British Mediterranean Expeditionary Force, Aug. 20, 1915; Sergeant, Aug. 26, 1915; Evacuated Suvla, sick, Nov. 26, 1915; Invalided to England, Jan. 3, 1916; Attached to Depot, Ayr, Feb. 24, 1916; Company Quartermaster Sergeant, April 10, 1916; Company Sergeant Major, April 14, 1916; 2nd Lieutenant, April 15, 1916; Embarked for Newfoundland, Aug. 23, 1916; Retired, March 15, 1917; Reattested and placed on active list, April 1, 1918; Embarked for U. K., June 22, 1918; British Expeditionary Force, Aug. 13, 1918; Evacuated to Hospital, sick, Oct. 13, 1918; Rejoined Battalion, Jan. 4, 1919; Transferred to U. K., Jan. 11, 1919; Embarked for Newfoundland, Jan. 30, 1919; Retired, Feb. 15, 1919. Enlisted, Sept. 8, 1914; British Mediterranean Expeditionary Force, Aug. 20, 1915; Served with 1st Composite Battalion on Western Egyptian Frontier, Nov. 1915 to Feb. 1916; British Expeditionary Force, March 2, 1916; Lance Corporal, Aug. 11, 1916; Corporal, Sept. 28, 1916; Killed in action, Gueudecourt, Oct. 12, 1916. Enlisted, Sept. 3, 1914; British Mediterranean Expeditionary Force, Aug. 20, 1915; Evacuated Suvla, sick, Oct. 14, 1915; Rejoined Battalion, Suez, Jan. 26, 1916; British Expeditionary Force, March 18, 1916; Wounded, Beaumont Hamel, July 1, 1916; Invalided to England, July 4, 1916; Lance Corporal, Feb. 12, 1917; Returned to B. E. F., April 25, 1917; Rejoined Battalion, June 7, 1917; Corporal, July 18, 1917; Wounded, Steenbeke, Aug. 23, 1917; Invalided to England, Nov. 1, 1917; Still on Strength. Enlisted, Sept. 16, 1914; British Mediterranean Expeditionary Force, Aug. 20, 1915; Sergeant, Sept. 21. 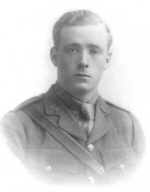 1915; British Expeditionary Force, March 14, 1916; Company Sergeant Major, April 29, 1916; 2nd Lieutenant, July 1, 1916; Evacuated to Hospital, Oct. 22, 1916; Invalided to England, Oct. 23, 1916; Attached to Depot, Ayr, Jan. 17, 1917; Returned to B. E. F., March 12, 1917; Wounded, Monchy, April 14, 1917; Invalided to England, April 20, 1917; Attached to Depot, Ayr, Nov. 10, 1917; Lieutenant, Jan. 1, 1918; Embarked for Newfoundland on special duty, March 13, 1918; Retired, St. John's, medically unfit, Oct. 7, 1918. Enlisted, Sept. 2, 1914; British Mediterranean Expeditionary Force, Aug. 20, 1915; Evacuated to England, Jan. 11, 1916; Attached to Depot 2nd Battalion, May 1, 1916; Lance Corporal, Sept. 16, 1916; Acting Corporal, Nov. 16, 1916; Acting Company Quartermaster Sergeant, Jan. 13, 1917; Confirmed to Rank of Sergeant, April 27, 1918; Honorary 2nd Lieutenant, March 17, 1919; Retired, March 17, 1919. Enlisted, Sept. 2, 1914; British Mediterranean Expeditionary Force, Aug. 20, 1915; Admitted to Hospital, Lemnos, Sept. 20, 1915; Invalided to England, Nov. 21, 1915; Reported to Depot, Ayr, Feb. 1, 1916; British Expeditionary Force, March 28, 1916; Wounded, Beaumont Hamel, July 1, 1916; Invalided to England, July 3, 1916; Returned to Newfoundland on furlough, Oct. 10, 1916; Discharged, St. John's, medically unfit, March 8, 1918. Enlisted, Sept. 5, 1914; British Mediterranean Expeditionary Force, Aug. 20, 1915; Evacuated Suvla, sick, Oct. 25, 1915; Died at 16th Stationary Hospital, Mudros, Nov. 24, 1915. Enlisted, Sept. 8, 1914; British Mediterranean Expeditionary Force, Aug. 20, 1915; Evacuated Suvla, sick, Nov. 25, 1915; Rejoined Battalion, Jan. 31, 1916; British Expeditionary Force, March 14, 1916; Killed in action, Beaumont Hamel, July 1, 1916. Enlisted, Sept. 2, 1914; British Mediterranean Expeditionary Force, Aug. 20, 1915; British Expeditionary Force, March 14, 1916; Wounded, Beaumont Hamel, July 1, 1916; Evacuated to England, July 8, 1916; Lance Corporal, Nov. 16, 1916; Corporal, Jan. 17. 1917; Returned to B.E. F., April 25, 1917; Wounded, Steenbeke, Aug. 16, 1917; Evacuated to England, Sept. 1, 1917; Acting Sergeant, Oct. 16, 1917; Repatriated to Newfoundland, Oct. 18, 1917; Discharged, St. john's, medically unfit, Nov. 22, 1917. Enlisted, Sept. 7, 1914; British Mediterranean Expeditionary Force, Aug. 20, 1915; Lance Corporal, Feb. 27, 1916; British Expeditionary Force, March 14, 1916; Wounded, Beaumont Hamel, July 1, 1916, Invalided to England, July 5, 1916; Attached to Depot, Ayr, Sept. 16, 1916; Embarked for Newfoundland on furlough, Sept. 27, 1916; Discharged, St. John's, medically unfit, March, 8, 1918. Enlisted, Sept. 7, 1914; Lance Corporal, April 26, 1915; 2nd Lieutenant, June 29, 1915; British Mediterranean Expeditionary Force, Aug. 20, 1915; Lieutenant, Jan. 1 1916; British Expeditionary Force, March 14, 1916; Evacuated to Hospital, April 20, 1916; Rejoined Battalion, July 14, 1916; Killed in action, Gueudecourt, Oct. 12, 1916. Enlisted, Sept. 7, 1914; Lance Corporal, April 26, 1915; Struck off Strength, Commissioned with Cameron Highlanders, April 8, 1915; Transferred from Cameron Highlanders to Newfoundland Regiment, Captain Clift, Oct. 26, 1917; British Expeditionary Force, Nov. 10, 1917; Awarded Military Cross, Sept. 16. 1918; Embarked for Newfoundland, Jan. 30, 1919; Retired, Feb. 25, 1919. Enlisted Sept. 2, 1914; British Mediterranean Expeditionary Force, Aug. 20, 1915; Evacuated Suvla, sick, Nov. 30, 1915; Invalided to England, Jan. 17, 1916, Attached to Depot, Ayr, April 28, 1916; Embarked for Newfoundland, Sept. 8, 1916; Discharged, St. John's medically unfit, Dec. 22, 1916. Enlisted, Sept. 8, 1914; British Mediterranean Expeditionary Force, Aug. 20, 1915; Served with 1st Composite Battalion on Western Egyptian Frontier, Nov. 1915 to Feb. 1916; British Expeditionary Force, March 2, 1916; Embarked for Newfoundland on furlough, July 27, 1918; Demobilized, St. John's, Feb. 15, 1919. Enlisted, Sept. 7, 1914; British Mediterranean Expeditionary Force, Aug. 20, 1915; Evacuated Suvla, sick, Oct. 26, 1915; Invalided to England, Nov. 24, 1915; British Expeditionary Force, March 28, 1916; Killed in action, Somme, June 28, 1916. Enlisted, Sept. 16, 1914; British Mediterranean Expeditionary Force, Aug. 20, 1915; Evacuated Suvla, sick, Dec. 1, 1915; Invalided to England, Dec. 24, 1915; Attached to Depot, Ayr, Feb. 11 1916; Lance Corporal, March 30, 1916; Corporal, Sept. 12, 1916; Acting Sergeant, Oct. 28, 1916; 2nd Lieutenant, Nov. 1, 1916; British Expeditionary Force, May 12, 1917; Killed in action, Broembeek, Oct. 9, 1917. Enlisted, Sept. 5, 1914; British Mediterranean Expeditionary Force Aug. 20, 1915; Evacuated Suvla, sick, Oct. 20, 1915; Rejoined Battalion, Suez, Tan. 26, 1916; British Expeditionary Force, March 14, 1916; Lance Corporal, July 12, 1916; Embarked for Newfoundland on furlough, July 27, 1918; Demobilized, St. John's, Feb. 15, 1919. Enlisted, Sept. 22, 1914; British Mediterranean Expeditionary Force, Aug. 20, 1911; Wounded, Suvla Bay, Oct. 31, 1915; Admitted Hospital, Cairo, Nov. 5, 1915; Rejoined Battalion, March 6, 1916; Evacuated to Hospital, sick, March 7, 1916; Discharged to Base, Alexandria, April 12, 1916; Invalided to England, May 17, 1916; Attached to Depot, Ayr, May 29, 1916; Embarked for Newfoundland, Dec. 12, 1918; Demobilized, St. John's, Jan. 29, 1919. Enlisted, Sept. 2, 1914; British Mediterranean Expeditionary Force, Aug. 20, 1915: Evacuated Suvla, sick, Oct. 10, 1915; Died at 19th General Hospital, Alexandria, Oct. 28, 1915. Enlisted, Sept. 5, 1914; British Mediterranean Expeditionary Force, Aug. 20, 1915; Evacuated Suvla, sick, Dec. 3, 1915; Invalided to England, Jan. 2, 1916; British Expeditionary Force, March 28, 1916; Killed in action, Beaumont Hamel, July 1, 1916. Enlisted, Sept. 3, 1914; Lance Corporal, Oct. 3, 1914; Transferred to Royal Division, Leith, and Struck off Strength, May 21, 1915. Enlisted, Sept. 16, 1914; British Mediterranean Expeditionary Force, Aug. 20, 1915; Evacuated Suvla, sick, Dec. 2, 1915; Rejoined Battalion Suez, Jan. 16, 1916; British Expeditionary Force. March 14, 1916; Evacuated to Hospital, April 3, 1916; Invalided to England, April 12, 1916; Attached to Depot, Ayr, May 6, 1916; Embarked for Newfoundland on furlough, July 21, 1918; Demobilized, St. John's, Feb. 15, 1917. Enlisted, Sept. 7, 1914; British Mediterranean Expeditionary Force, Aug. 20, 1915; Served with 1st Composite Battalion on Western Egyptian Frontier, Nov. 1915 to Feb. 1916; British Expeditionary Force, March 2, 1916; Killed in action, Gueudecourt, Oct. 12, 1916. Enlisted, Sept. 17, 1914; British Mediterranean Expeditionary Force, Aug. 20, 1915; Evacuated Suvla, sick, Dec. 5, 1915; Invalided to England, Dec. 26, 191 5; Attached to Depot, Ayr, Feb. 24, 1916; British Expeditionary Force, Sept. 7, 1917; Joined Battalion, Oct. 12, 1917: Wounded, Neuve Eglise, April 13, 1918; Invalided to England, April 23, 1918; Admitted to 3rd London General Hospital, Wandsworth, April 20, 1918; Died of Wounds, April 26, 1918. Enlisted, Sept. 11, 1914; British Mediterranean Expeditionary Force Aug. 20, 1915; Evacuated Suvla, sick, Nov. 28, 1915; Rejoined Battalion, Suez, March 1, 1916; British Expeditionary Force, March 14, 1916; Wounded, Beaumont Hamel, July 1, 1916; Invalided to England, July 8, 1916; Repatriated to Newfoundland, Sept. 13, 1917; Discharged St. John's, medically unfit, Feb. 14, 1918. Enlisted, Sept. 5, 1914; British Mediterranean Expeditionary Force, Aug. 20, 1915; British Expeditionary Force, March 14, 1916; killed in action, Beaumont Hamel, July 1, 1916. Enlisted, Sept. 8, 19 4; Struck off Strength, Newton on Ayr, time expired, Oct. 15, 1915; Reattested for service with Newfoundland Forestry Company, Nov. 14, 1917; Embarked for U. K ., Nov. 1917; Embarked for Newfoundland, June 24, 1919; Demobilized, St. John's, July 31, 1919. Enlisted, Sept. 2, 1914; British Mediterranean Expeditionary Force, Aug. 20, 1915; Invalided to England, Oct. 21, 1915; British Expeditionary Force, March 28, 1915; Wounded, Beaumont Hamel, July 1 1916; Invalided to England; Returned to B. E. F., March 25, 1917; Lance- Corporal, Nov. 1, 19l7; Acting Corporal, Dec. 26, 1917; Embarked for Newfoundland on duty, May 22, 1918; Discharged, St. John's, medically unfit, Dec. 7, 1918. Enlisted Sept. 2, 1914; British Mediterranean Expeditionary Force, Aug. 20, 1915; Evacuated Suvla, sick, Oct. 31, 1915; Rejoined Battalion, Suez, Jan. 26, 1916; British Expeditionary Force, March 14, 1916; Wounded, Beaumont Hamel, July 1, 1916; Invalided to England, July 3, 1916; Repatriated to Newfoundland, Feb. 17, 1917; Discharged, St. John's, medically unfit, March 28. 1917. Enlisted, Sept. 5, 1914; British Mediterranean Expeditionary Force, Aug. 20, 1915; Evacuated Suvla, sick, Oct. 22, 1915; Invalided to England, Dec. 26, 1915; Attached to Depot, Ayr, April 26, 1916, British Expeditionary Force, June 25, 1916; Wounded, Gueudecourt, Oct. 12, 1916; Invalided to England, Oct. 16, 1916; Attached to Depot, Ayr, Nov. 30, 1916; Lance Corporal, Jan. 17, 1917; Returned to B. E. F. Jan. 31, 1917; Admitted to Hospital, Rouen, Feb. 3. 1917; Rejoined Battalion, May 7, 1917; Wounded, Marcoing, Nov. 20, 1917; Invalided to England, Nov. 24, 1917; Attached to Depot, Ayr, Tan. 7, 1918; Returned to B. E. F., Feb. 4, 1918; Corporal, March 16, 1918; Sergeant, April 25, 1918; Embarked for Newfoundland on special duty, May 22, 1918; Returned to U. K., Oct. 12, 1918; Joined Battalion, Jan. 5, 1919; Embarked for Newfoundland, April 23, 1919; Demobilized, St. John's, June 10, 1919. Enlisted, Sept. 5, 1914; British Mediterranean Expeditionary Force, Aug. 20, 1915; British Expeditionary Force, March 14, 1916; Wounded, Beaumont Hamel, July 1, 1916; Invalided to England, July 5, 1916; Attached to Depot, Ayr, Sept. 16, 1916; Lance Corporal, Jan. 17, 1917; Returned to B. E. F., March 4, 1917; Rejoined Battalion, March 31, 1917; Killed in action, Monchy, April 14, 1917. Enlisted, Sept. 8, 1914; British Mediterranean Expeditionary Force Aug. 20. 1915; British Expeditionary Force, March 14, 1916; Wounded Beaumont Hamel, July 1, 1916; Invalided to England, July 3, 1916 Attached to Depot, Ayr, Aug. 1, 1916; Returned to B. E. F., Feb. 10 1917; Wounded, Monchy, April 14, 191; Invalided to England, May 7, 1917; Attached to Depot, Ayr, July 27, 1917; Embarked for Newfoundland on furlough, July 21, 1918; Discharged, St. John's, medically unfit, Aug. 31, 1918. Enlisted, Sept. 15, 1914; British Mediterranean Expeditionary Force, Aug. 20, 1915; Evacuated-Suvla, sick, Dec. 24, 1915; Invalided to England, Dec. 26, 1915; Attached to Depot, Ayr, Feb. 28, 1916; British Expeditionary Force, April 13, 1916; Joined Battalion, April 26, 1916; Wounded, Somme, June 28, 1916; Invalided to England, June 28, 1916; Attached to Depot, Ayr, Sept. 23, 1916; Returned to B. E. F., Oct. 3, 1916; Lance Corporal, Dec. 3, 1916; Corporal, Feb. 9, 1917; Prisoner of War, captured at Monchy, April 14, 1917; Repatriated to England from Germany, Dec. 26, 1918; Attached to Depot, Winchester, Dec. 30, 1918; Embarked for Newfoundland, March 12, 1919; Demobilized, St. John's, June 20, 1919. Enlisted, Sept. 2, 1914; British Mediterranean Expeditionary Force, Aug. 20, 1915; Evacuated to England, sick, Nov. 9, 1915; British Expeditionary Force, Aug. 24, 1916; Awarded Military Medal, July 9, 1917; Returned to Newfoundland on furlough 1 Sept. 7, 1918; Demobilized, St. John's, Feb. 25, 1919. Enlisted, Sept. 7, 1914; British Mediterranean Expeditionary Force, Aug. 20, 1915; Lance Corporal, Dec. 10, 1915; Admitted to Hospital, Malta, Jan. 8, 1916; Discharged to duty, March 4, 1916; British Expeditionary Force, March 18, 1916; Evacuated to Hospital, June 15, 1916; Invalided to England, June 25, 1916; Attached to Depot, Ayr, July 18, 1916; Acting Corporal, Aug. 11, 1916; Sergeant, Oct. 27, 1916; Acting Company Quartermaster Sergeant, Aug. 24, 1917; Company Sergeant Major, Oct. 4, 1918; Wounded, Ledgeham, Oct. 14, 1918; Invalided to England, Dec. 4, 1918; Repatriated to Newfoundland, Feb. 15, 1919; Demobilized, St. John's, Aug. 30, 1919. Enlisted, Sept. 5, 1914; British Mediterranean Expeditionary Force, Nov. 14, 1915; British Expeditionary Force, March 14, 1916; Wounded, Beaumont Hamel, July 1, 1916; Invalided to England, July 7, 1916; Attached to Depot, Ayr, Sept. 13, 1916; Returned to B. E. F., Dec. 30, 1916; Rejoined Battalion, Jan. 17, 1917; Wounded, Monchy, April 14, 1917; Admitted to Hospital, April 15, 1917; Discharged to Base at Rouen, May 18, 1917; Rejoined Battalion, June 11, 1917; Wounded, Steenbeke, Aug. 24, 1917; Discharged to Base at Rouen from hospital, Sept. 26, 1917; Rejoined Battalion, Oct. 12, 1917; Wounded, Marcoing, Nov. 20, 1917; Invalided to England, Nov. 23, 1917; Attached to Depot, Ayr, Feb. 14, 1918; Embarked for Newfoundland on furlough, July 21, 1918; Demobilized, St. John's, Feb. 15, 1919. Enlisted, Sept. 5, 1914; British Mediterranean Expeditionary Force, Aug. 20, 1915; Wounded, Suvla Bay, Oct. 5, 1915; Invalided to England, Nov. 16, 1915; British Expeditionary Force, Oct. 3, 1916; Joined Battalion in the field, Oct. 12, 1916; Prisoner of War, captured at Monchy, April 14, 1917; Repatriated to England Dec. 18, 1918; Returned to Newfoundland, Jan. 30, 1919; Demobilized, St. John's, March 28, 1919. Enlisted, Sept. 2, 1914; British Mediterranean Expeditionary Force, Aug. 20, 1915; British Expeditionary Force, March 14, 1916; Wounded, Beaumont Hamel, July 1. 1916; Embarked for Newfoundland, July 10, 1917; Discharged, St. John's, medically unfit, June 14, 1918. Enlisted, Sept. 28, 1914; British Mediterranean Expeditionary Force, Aug. 20, 1915, Lance- Corporal, Nov. 19, 1915; Evacuated Suvla, sick, Nov. 30, 1915; Rejoined Battalion at Suez, Jan. 16, 1916; British Expeditionary Force, March 14, 1916; Wounded, Beaumont Hamel, July 1, 1916; Invalided to England, July 4, 1916; Attached to 2nd Battalion, Nov. 8, 1916; Embarked for Newfoundland, Nov. 25, 1916; Discharged, St. John's, medically unfit, Dec. 29, 1916; Reattested for special duty at headquarters, St. John's, April 1, 1918; Acting Corporal, June 10, 1918; Sergeant, Oct. 15, 1918; Demobilized, March 28, 1919. Enlisted, Sept. 22, 1914; British Mediterranean Expeditionary Force Aug. 20, 1915; Evacuated Suvla, sick, Dec. 1, 1915; Invalided to England, Dec. 31, 1915; Attached to Depot, Ayr, March 13, 1916; Embarked for Newfoundland on furlough, Sept. 5, 1916; Returned to U. K. and attached to Depot, Ayr, April 30, 1917; British Expeditionary Force, Aug. 5, 1917; Wounded, Marcoing, Nov. 20, 1917; Invalided to England, Nov. 27, 1917; Attached to Depot, Ayr, Jan. 7, 1918 Embarked for Newfoundland, Jan. 30, 1919; Demobilized , St. John's April 12, 1919. Enlisted, Sept. 15, 1914; British Mediterranean Expeditionary Force, Aug. 20, 1915; Wounded, Suvla, Dec. 11, 1915; Admitted to Hospital, Malta, Dec. 12, 1915; Invalided to England, May 17, 1916; Attached to Depot, Ayr, May 29, 1916; British Expeditionary Force, April 25, 1917; Joined Battalion, June 7, 1917; Wounded, Broembeek, Oct. 9, 1917; Invalided to England, Oct. 18, 1917; Attached to Depot, Winchester, Jan. 24, 1918; Lance Corporal, Feb. 19, 1918; Acting Corporal, May 29, 1918; Embarked for Newfoundland on furlough, July 21, 1918; Discharged, St. John's, medically unfit, Dec. 7, 1918. Enlisted, Sept. 2, 1914; Lance Corporal July 28, 1915; British Mediterranean Expeditionary Force, Aug. 20, 1915; Evacuated Suvla, sick, Sept. 23, 1915; Admitted to Hospital, Alexandria, Sept. 26, 1915; Discharged to duty, Oct. 25, 1915; Attached for duty to 3rd Echelon, Alexandria, Oct. 28, 1915; British Expeditionary Force, March 18, 1916; Acting Sergeant, April 14, 1916; Admitted to hospital, Rouen, Dec. 9, 1916; Invalided to England, Dec. 20, 1916; Returned to B. E. F., Sept. 26, 1917; Orderly Room Sergeant, Oct. 3, 1917; Invalided to England, July 26, 1918; Discharged to duty, Aug. 27, 1918; Returned to B. E. F., Sept. 7, 1918; and rejoined 3rd Echelon; Taken on Strength of 1st Battalion, April 3, 1919; Attached for duty to Pay and Record Office, London, April 23, 1919; Acting Staff Sergeant, April 23, 1919; Demobilized, U. K., June 24, 1919. Enlisted, Sept. 2, 1914; British Mediterranean Expeditionary Force, Aug. 20, 1915; British Expeditionary Force, March 2, 1916; Awarded Military Medal, July 1, 1916; Corporal, Feb. 9, 1917; Sergeant, May 8, 1917; Wounded, Steenbeke, Aug. 14, 1917; Invalided to England, Aug. 18, 1917; Embarked for Newfoundland on duty, May 6, 1918; Acting Company Sergeant Major, March 24, 1919. Enlisted, Sept. 1, 1914; Acting Quartermaster, Sept. 5, 1914; Acting Sergeant, Sept. 26, 1914; Company Sergeant Major, Oct. 29, 1914; British Mediterranean Expeditionary Force, Aug. 20, 1915; British Expeditionary Force, March 14, 1916; Acting Regimental Sergeant Major, May 29, 1916; 2nd Lieutenant, June 11, 1916; Wounded, Beaumont Hamel, July 1, 1916; Invalided to England; Returned to B. E. F., April 23, 1917; Repatriated to Newfoundland, Feb. 6, 1918; Assistant Director recruiting, St. John's, April 9, 1918; Captain, Sept. 1, 1918; Demobilization Officer, Nov. 25, 1918; Retired, March 31, 1919. WILLIAM PATRICK DOHANEY Reg. No. 496. Enlisted, Sept. 14, 1914; British Mediterranean Expeditionary Force, Aug. 20, 1915; Evacuated Suvla, sick, Nov. 25, 1915; Rejoined Battalion, Suez, Jan. 26, 1916; British Expeditionary Force, March 14, 1916; Killed in action. Beaumont Hamel, July 1, 1916. Enlisted, Sept, 4, 1914; British Mediterranean Expeditionary Force, Aug. 20, 1915; Served with 1st Composite Battalion on Western Egyptian Frontier, Nov. 1915 to Feb. 1916; British Expeditionary Force, March 2, 1916; Lance Corporal, Nov. 5, 1916; Corporal, May I 1, 1917; Acting Sergeant, July 24, 1917; Returned to Newfoundland on furlough, July 27, 1918; Demobilized, St. John's, Feb. 15, 1919. Enlisted, Sept. 2, 1914; British Mediterranean Expeditionary Force, Aug. 20, 1915; Killed in Action, Suvla Bay, Dec. 12, 1915. Enlisted, Sept. 2, 1914; British Mediterranean Expeditionary Force, Aug. 20, 1915; British Expeditionary Force, March 14, 1916; Killed in action, Beaumont Hamel, July 1, 1916. Enlisted Sept. 4, 1914; British Mediterranean Expeditionary Force, Aug. 20: 1915; Appointed Orderly Room Clerk in the Field, Feb. 1, 1916; British Expeditionary Force, March 14, 1916; Corporal, July 12, 1916; Sergeant, Oct. 22, 1916; Staff Sergeant, April 25, 1918; Acting Regimental Quartermaster Sergeant, Sept. 4, 1918; Returned to Newfoundland on furlough, July 27, 1918; Attached to Depot, St. John's, for duty, Nov. 28, 1918; Still on Strength. Enlisted, Sept. 7, 1914; Lance Corporal, April 24, 1915; British Mediterranean Expeditionary Force, Aug. 20, 1915; Wounded, Suvla Bay, Dec. 1, 1915; Died of wounds at 88th Field Ambulance, Dec. 1, 1915. Enlisted, Sept. 2, 1914; Sergeant, Sept. 21, 1914; Company Sergeant Major, Oct. 29, 1914; British Mediterranean Expeditionary Force, Aug. 20, 1915; Acting Regimental Sergeant Major, Aug. 23, 1915; Evacuated Suvla, sick, Dec. 2, 1915, Rejoined Battalion, Suez, March 1, 1916; British Expeditionary Force, March 14, 1916; 2nd Lieutenant, July 1, 1916; Wounded, Gueudecourt, Oct. 12, 1916; Admitted 8th General Hospital, Rouen, Oct. 14, 1916; Died of wounds, Oct. 15, 1916. Enlisted, Sept. 4, 1914; Lance Corporal, April 8, 1915; Corporal, July 27, 1915; British Mediterranean Expeditionary Force, Aug. 20, 1915; Acting Company Quartermaster Sergeant, Nov. 11, 1915; Sergeant Nov. 14, 1915; Wounded, Suvla Bay, Dec. 5, 1915; Discharged to duty, Jan. 19, 1916; Confirmed to Rank of Company Quartermaster Sergeant, Jan. 31, 1916; British Expeditionary Force, March 14, 1916; 2nd Lieutenant, June 5, 1916; Returned to Newfoundland on duty, July 11, 1916; Embarked for U. K., Aug. 28, 1916; Returned to B. E. F., Oct. 27, 1916; Killed in action, Sailly-Saillisel, Feb. 26, 1917. Enlisted, Sept. 2, 1914; British Mediterranean Expeditionary Force, Aug. 20, 1915; Evacuated Suvla, sick, Nov. 1, 1915; Invalided to England, Nov. 30, 1915; Attached to Depot, Ayr, April 3, 1916; British Expeditionary Force, Dec. 12, 1916; Evacuated to Hospital, March 17, 1917; Invalided to England, March 29, 1917; Attached to Depot, Ayr, April 13, 1917; Returned to B. E. F., June 3, 1917; Killed in action at Centre Sector, Steenbeke, Aug. 21, 1917. Enlisted, Sept. 8, 1914; British Mediterranean Expeditionary Force, Aug. 20, 1915; Evacuated Suvla, sick, Nov. 26, 1915, Rejoined Battalion, Suez, March 1, 1916; British Expeditionary Force, March 14, 1916; Wounded, Beaumont Hamel, July 1, 1916; Invalided to England, July 4, 1916; Admitted to Royal Victoria Hospital, Netley, July 5, 1916; Died of wounds, July 21, 1916. Enlisted, Sept. 2, 1914; British Mediterranean Expeditionary Force, Nov. 14, 1915; British Expeditionary Force, March 14, 1916; Killed in action, Beaumont Hamel, July 1, 1916. Enlisted, Sept. 8, 1914; British Mediterranean Expeditionary Force, Aug. 20, 1915; Evacuated Suvla, sick, Nov. 15, 1915; Rejoined Battalion, Suez, March 1, 1916; British Expeditionary Force, March 14, 1916; Lance Corporal, May 18, 1916; Killed in action, Beaumont Hamel, July 1, 1916. Enlisted, Sept. 2, 1914; British Mediterranean Expeditionary Force, Aug. 20, 1915; British Expeditionary Force, May 9, 1915; Lance Corporal, Oct. 1, 1916; Evacuated to England, sick, March 15, 1917; Returned to B. E. F., Aug. 5, 1917; Wounded, Broembeek, Oct. 9, 1917; Evacuated to England, Oct. 13, 1917; Acting Corporal, May 29, 1918; Returned to Newfoundland on furlough, July 21, 1918; Demobilized, St. John's, Feb. 15, 1919. Enlisted Sept. 2, 1914; Lance Corporal, Sept. 21, 1914; Corporal, April 23: 1915; Signal Sergeant, July 10, 1915; British Mediterranean Expeditionary Force, Aug. 20, 1915; British Expeditionary Force, March 14, 1916; Killed in action, Beaumont Hamel, July 1, 1916. Enlisted, Sept. 9, 1914; British Mediterranean Expeditionary Force, Aug. 20, 1915; Evacuated Suvla, sick, Oct. 20, 1915; Invalided to England, Nov. 24, 1915; Attached to Depot, Ayr, Aug. 12, 1916; British Expeditionary Force, Dec. 12, 1916; Wounded, Monchy, April 14, 1917; Invalided to England, April 21, 1917; Attached to Depot, Ayr, May 19, 1917; Returned to B. E. F., Aug. 5, 1917; Wounded, Broembeek, Oct. 9, 1917; Joined Base Depot, Rouen, Nov. 12, 1917; Joined Battalion, Dec. 4, 1917; Lance-Corporal, Dec. 26, 1917; Embarked for Newfoundland on furlough, July 27, 1918; Demobilized, St. John's, Feb. 15, 1919. Enlisted, Sept. 2, 1914; British Mediterranean Expeditionary Force, Aug. 20, 1915; Wounded, Suvla Bay, Nov. 8, 1915; Evacuated to England, sick, Nov. 30, 1915; British Expeditionary Force, April 6, 1918; Embarked for Newfoundland on furlough, Sept. 7, 1918; Demobilized, St. John's, Feb. 15, 1919. Enlisted, Sept. 3, 1914; British Mediterranean Expeditionary Force, Aug. 20, 1915; British Expeditionary Force, March 28, 1916; Lance Corporal, July 12, 1916; Wounded, Belgium, Aug. 18, 1916; Evacuated to England, Aug. 30, 1916; Repatriated to Newfoundland, April 10, 1917; Discharged, St. John's, medically unfit, May 11, 1917; Reattested for duty at Depot, St. John's, June 21, 1917; Acting Corporal, May 22, 1918; Demobilized, St. John's, Sept. 30, 1919. Enlisted, Sept. 4, 1914; British Mediterranean Expeditionary Force, Aug. 20, 1915; British Expeditionary Force, March 14, 1916; Lance Corporal, June 11, 1916; Corporal, July 12, 1916; Wounded, Somme raid, Nov. 30, 1916; Invalided to England, Dec. 25, 1916; Attached to Depot, Ayr, April 2, 1917; Embarked for Newfoundland on duty, July 18, 1917; Discharged, St. John's, medically unfit, April 2, 1918. Enlisted, Sept. 15, 1914; British Mediterranean Expeditionary Force, Nov. 14, 1915; British Expeditionary Force, March 14, 1916; Wounded, Beaumont Hamel, July 1, 1916; Invalided to England, July 4, 1916; Attached to Depot, Ayr, Aug. 18, 1916; Embarked for Newfoundland, July 10, 1917; Attached for duty to Headquarters, St. John's, Oct. 6, 1917; Demobilized, July 25, 1919. Enlisted, Sept. 8, 1914; British Mediterranean Expeditionary Force, Aug. 20, 1915; Killed in action, Suvla, Dec. 1, 1915; Mentioned in dispatches, London Gazette, July 11, 1916. Enlisted, Sept. 5, 1914; British Mediterranean Expeditionary Force, Aug. 20, 1915; Evacuated, Suvla, sick, Oct. 19, 1915; Rejoined Battalion, Suez, Jan. 16, 1916; British Expeditionary Force, March 14, 1916; Wounded, Beaumont Hamel, July 1, 1916; Invalided to England, July 4, 1916; Attached to Depot, Ayr, Aug. 1, 1916; Returned to B. E. F., Oct. 3, 1916; Evacuated to Hospital, Nov. 25, 1916; Joined Battalion, March 2, 1917; Lance Corporal, Oct. 16, 1918; Evacuated to Hospital, Oct. 23, 1918; Rejoined Battalion, Dec. 31, 1918; Embarked for Newfoundland, Jan. 30, 1919; Demobilized, St. John's, March 10, 1919. Enlisted, Sept. 2, 1914; British Mediterranean Expeditionary Force, Aug. 20, 1915; British Expeditionary Force, March 3, 1916; Wounded, Beaumont Hamel, July 1, 1916; Invalided to England, July 5, 1916; Attached to Depot, Aug. 17, 1916; Lance Corporal, Aug. 22, 1916; Corporal, Oct. 27, 1916; Acting Sergeant, Jan. 17, 1917; Second Lieutenant, Sept. 25, 1917; Returned to B. E. F., Jan. 5, 1918; Embarked for Newfoundland on furlough, July 24, 1918; Returned to U. K., Oct. 19, 1918; Returned to B. E. F., Nov. 4, 1918; Lieutenant, March 25, 1919; Transferred to U. K., April 27, 1919; Embarked for Newfoundland, May 22, 1919; Retired, St. John's, July 5, 1919.